Here’s a brilliant graph, from the Calculated Risk blog, an excellent site run by Bill McBride which mainly covers US macroeconomic developments. The graph came from this post, and I’m using it with Bill’s permission. It’s about the US labour market, and even if that’s not of great (or indeed any) interest to you, bear with me, because I’ve put up this graph for a variety of other reasons as well. The first reason is to make the point, again, that national statistics authorities need to get their act together and think of better ways to present their data. I have no doubt that the good people at America’s Bureau of Labor Statistics (BLS) are public-spirited professionals, but they don’t know how to present data to save their lives. If you don’t believe me, have a look at the BLS’s release of the underlying data, which looks as if it was written in 1970 on an IBM Selectric typewriter. There isn’t a single graph in the whole thing. Yes, I know, there’s a school of thought that the official statisticians’ job is just the facts, ma’am, but I think it’s several decades past its use-by. The sky has not fallen when (for example) our own Statistics NZ puts out data, commentary, and several kinds of graphs (here’s this week’s full retail sales release, for example). OK, here’s the graph itself. This is a really neat graphical summary of what’s happening in the US labour market. On the one hand you’ve got voluntary job ‘quits’ (the light blue bar), and ‘layoffs and discharges’ (the red bar), which when added together gives you the total number of people who left or lost their jobs. And on the other you’ve got new ‘hires’ (the dark blue line). When hires outnumber quits plus layoffs, total employment rises, and conversely when hires fall short, employment falls. And, for completeness, you can new job openings (the yellow line), which is employers’ demand for staff. I loved everything about this graph – the clear, bright colours, the logic, the value add to the underlying data. But quite apart from its graphical excellence, it also says quite a lot about how economies work. Often, the overall result in many markets is the net outcome of two very large gross numbers. Behind any small overall movement – employment, business creation – there tends to be a vast boiling undercurrent of gross turnover. It’s emphatically not the case that employment falls (for example) because virtually everyone keep their jobs and a very small number lose theirs. The reality is that if employment falls in any given month, it’s because there is a very large number of new jobs created, slightly outweighed by an even larger number of jobs lost or given up. It gives you a Schumpeterian shiver up your back. The gross flows can be immense: as the BLS helpfully points out, “Over the 12 months ending in June 2014, hires totaled 55.7 million and separations totaled 53.3 million, yielding a net employment gain of 2.4 million. These figures include workers who may have been hired and separated more than once during the year”. Which also reminds us not to read too much into statistics that are the small number resultant of two much larger numbers: whether it’s net new jobs, or the balance of payments deficit, or the savings rate, little errors in any of the big gross numbers can be as large as the net resultant itself. I’m personally of the view that these high levels of turnover reflect (and accommodate) efficiency and flexibility, and you stand in their way at your peril. There are plenty of people who disagree: they don’t like the essentially ‘fire at will’ nature of the US labour market, and they’d rather that employers didn’t have such a free hand. But less flexible, or outright inflexible, labour markets don’t help anyone, as the youth unemployment rates across much of Europe demonstrate (they’re not just a cyclical austerity story). Policy moral, in my view: mitigate the influence on individuals and communities by all means, equip people to the max with the skills to play the game, and get out of the way. You’re doing employees and businesses no favours when you throw sand in the works. Finally, for those who do have an interest in how the US is travelling, the news in the graph is pretty good. 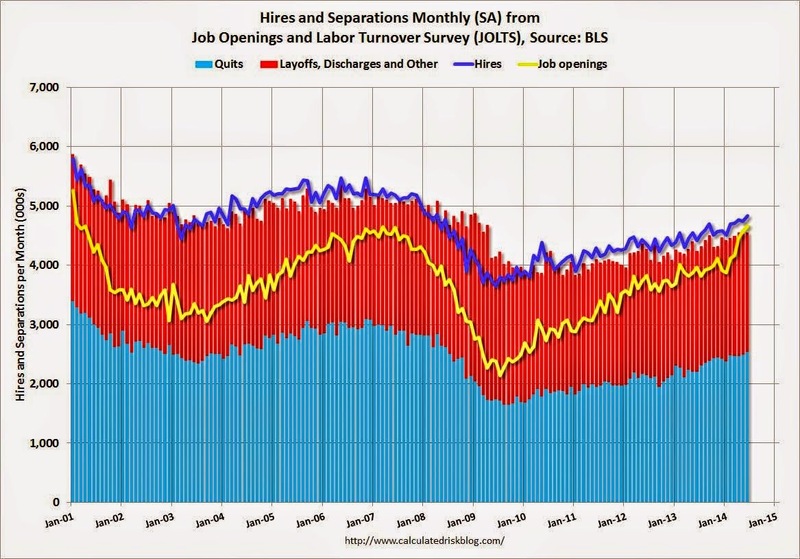 The dark blue line is keeping its head above the combined blue and red bars, so total employment is rising. The ‘help wanted’ ads have been steadily increasing: they bottomed out in the middle of 2009, and have roughly doubled since. And ‘quits’ are also increasing, which among other things reflects increased confidence about jobs availability. As you can see, the GFC left a big scar on the level of ‘quits’, which haven’t got back to pre-GFC levels yet, and so far it’s hardly a rip-snorter of a recovery: recent monthly net new jobs have been around the 200,000 to 250,000 mark, which aren’t enough to make much of a dent in the unemployment rate. But even so, it still all adds up to a picture of sustained if still modest expansion.